Grooms-to-be, take note. This is just about the coolest groomsmen's gift out there. 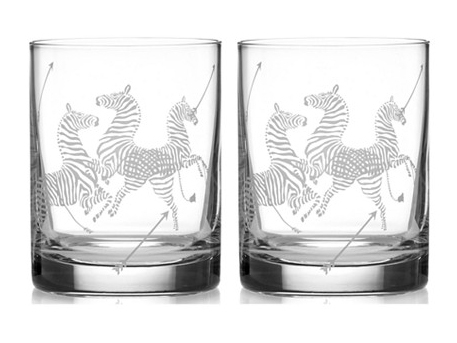 A pair of double old fashioned glasses with Scalamandre's iconic zebra. Even if you are not a groom, wedding season is quickly approaching so you're welcome for a great wedding gift idea. I don't know a bride who wouldn't want these fashionable items gracing her bar! The sun has made an appearance this week and I know one two-year-old who is thrilled to be back on the playground scene. Hope it's warming up near you. Have a fantastic weekend...see you next week! These are just the perfect gift, Scalamandre's zebras, always very special! Not sure if a guy would be into these. A leather travel kit would be better, perhaps?